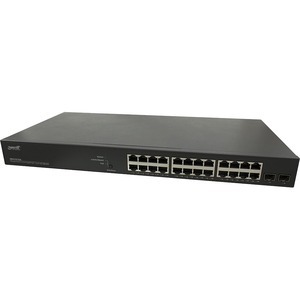 This switch is a next generation smart managed switch with 52Gbps switching capacity. It provides (24) 10/100/1000Base-T copper ports with IEEE 802.3at PoE+ capability and (2) additional 100/1000 dual speed SFP slots. The embedded Device Management System (DMS) provides the benefits of ease of use in the IP surveillance, wireless Access Point and other applications. The DMS capability built into the switches is new from Transition Networks and provides time-saving features enabling security integrators or network administrators to establish and document a baseline deployment, automatically discover and remotely configure attached IP-powered devices (PDs).